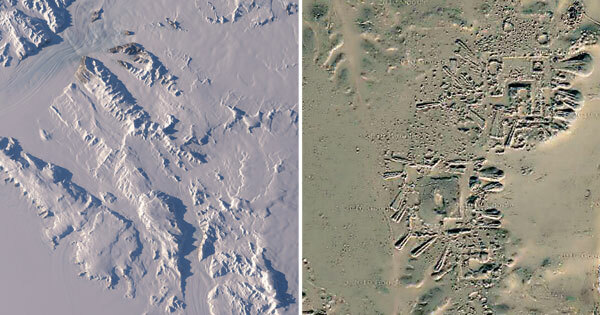 10 Comments on "Antarctica: NASA Images Reveal Traces of Ancient Human Settlement Underneath 2.3 km of Ice"
Earth has been hit by meteors and obviously a few larger objects like an asteroid that left a huge crater..so it could have been knocked of its axis in the past..destroying old cities ,civilizations. How many times has life thrived,only to be brought down again by changes in weather. This cycle will continue. Human civilization is a lot older than we think. So is man. Anyone interested in this discovery should look up Graham Hancock’s books “fingerprints of the gods” and “magicians of the gods”. He has been exploring the mystery of missing ancient civilizations for the better part of 30 years and touched on this very topic back in the early 90’s. This article fails to mention that the Piri Reis map from 500 years ago was copy by the Turkish admiral from several other much older maps. Also, another possibility is tectonic shift. While gradual, who can say for sure that aren’t forces or events in our universe that could cause a cataclysmic shift? The “city” could be extremely old, possibly from a prior civilization now destroyed. You better read more about the Piri Reis map. It is not a copy of anything and entirely authentic work waaay ahead of its time. The map was created from much older maps. He even mentions that fact in the margins of the map itself. If memory serves me, the maps in which this one was comprised were at the library at Alexandria and were in poor condition, and if he hadn’t made this map the info would’ve been lost forever. Sounds like you need to read A LOT more about the Piri Reis map John, actually if you had ever read anything at all about it you probably wouldn’t have said what you just did, sheesh lol. How ancient could it be? Once the land bridge finally broke, ocean currents were enabled to completely circle the South Pole and the climate there rapidly became cold and frozen. There are the remains of ancient trees in Victoria, Australia, which are pine trees from that era far distant in the past. In terms of Time Scale, there are also some interesting conclusions which may be inferred from data obtained by the WMAP survey of Universal Space, and the connection between Spacial Gravity and Earth Time.